Feed-in-tariffs have seen widespread proliferation of renewable energy schemes nationwide but do they represent a valid form of environmental protection or just another form of commercial exploitation? For most lovers of the natural environment, October was a superb month – dry, crisp autumn days being enjoyed across the UK from Sutherland to Snowdonia. For environmental conservationists and many outdoor enthusiasts who love the mountains North Wales, there was another ray of light in October when RWE npower, part of the German multinational utility company RWE, withdrew its second planning application for a large scale hydropower development on the Conwy. The £12 million Afon Conwy scheme put forward by RWE had attracted widespread criticism – petitions signed by thousands and letters from likes of Patagonia’s Yvon Chouinard, lending weight to the arguments of conservationists concerned not only by the potential impact of individual projects such as this, but about the proliferation of many smaller hydropower schemes throughout Snowdonia, tapping into the regions climate, high average rainfall and numerous upland rivers and streams. Hydropower has long been a contentious matter. Just as many of the polarised arguments which surround wind farms have tended to avoid issues such as the industrialisation of wild places, so much of the support for hydropower has yet to tackle questions that have arisen regarding bulldozed access tracks and habitat loss for instance in areas which are protected by European, indeed international designations. 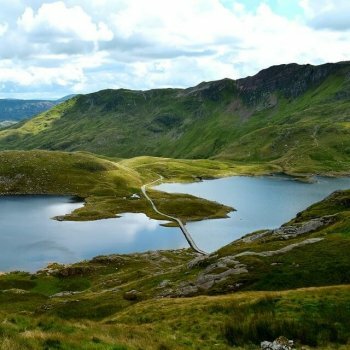 Of course it is not just the abundance of water courses or high rain fall that is driving the development of hydroelectric schemes in Snowdonia specifically. A little over five years ago, feed-in-tariffs (FITs) were introduced by the government to drive the production of renewable energy and crucially, made such schemes a far more commercially attractive proposition for big businesses. And therein lies the question – it is not a new question by any means, but one which is becomingly increasingly obvious. Can commercial and environmental interests ever be comfortable bed-fellows or does the use of incentives such as FITs, fundamentally undermine the green credentials of the schemes they support? Certainly there are many environmentally sensitive and appropriately designed renewable energy and hydro schemes specifically, but the question of wider exploitation remains. Ultimately, viewing our National Parks or indeed the natural environment generally as just another commodity is a dangerous position. It is all too easy to say time will tell when it comes to deciding whether certain renewable schemes are a viable means of reducing carbon emissions or simply commercial exploitation. Yes, time will certainly tell. It always does. But by then, it may well be too late.